This past week I attended an online ladies conference. It’s was such a blessing! Can’t wait to implement what I’ve learned into my homemaking and share with you along the way. 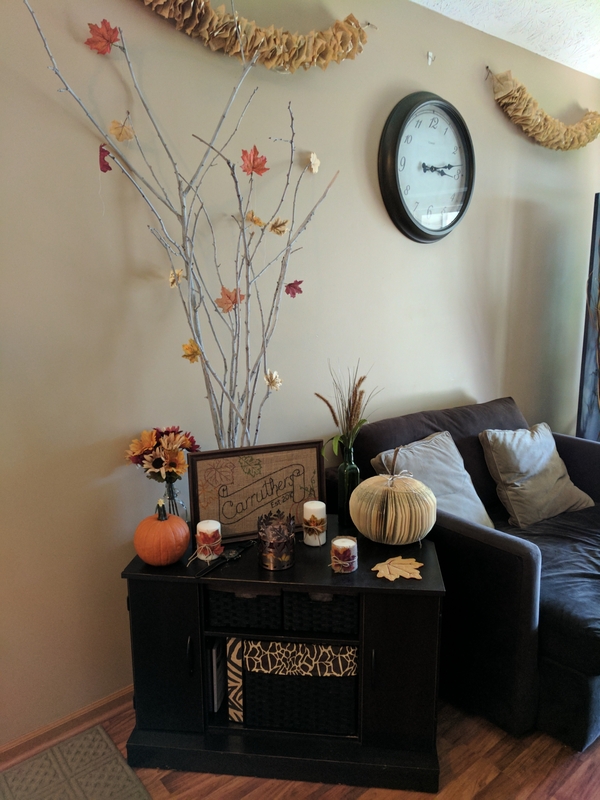 Well, my fall decorating is pretty much done (except for my book page leaf banner because the leaves are taking their sweet time turning this year). So it’s time to show you all my cozy decorations. 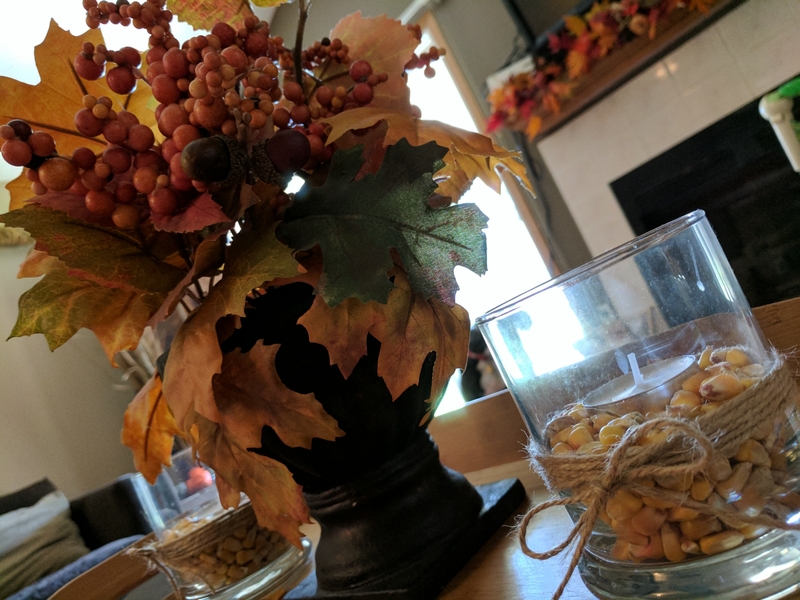 Firstly, in my kitchen I have just a little bit of fall. 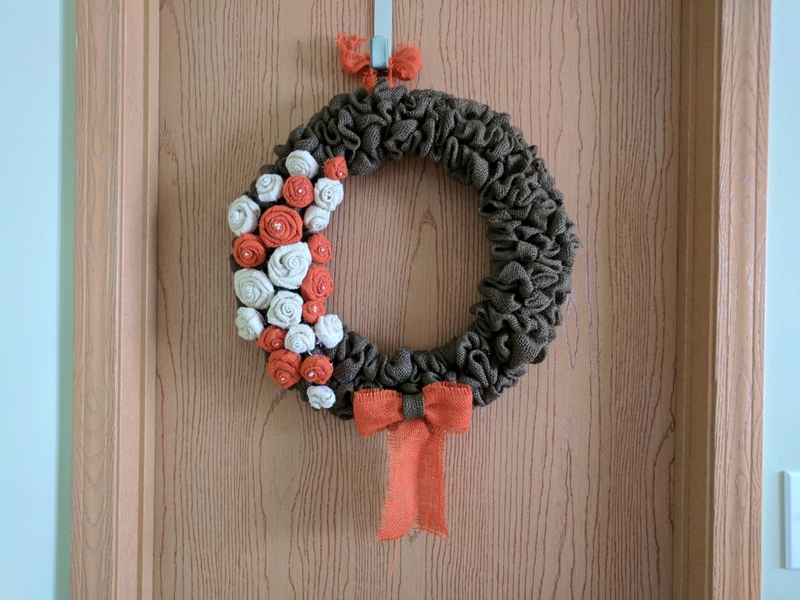 My sister made this wreath for me as a Christmas present a few years ago. It’s hanging in the dining room on the laundry room door. Those walls are not really blue… They are green. Strange lighting. Of course, being on the dining room, you’ve already seen this beauty on my table. 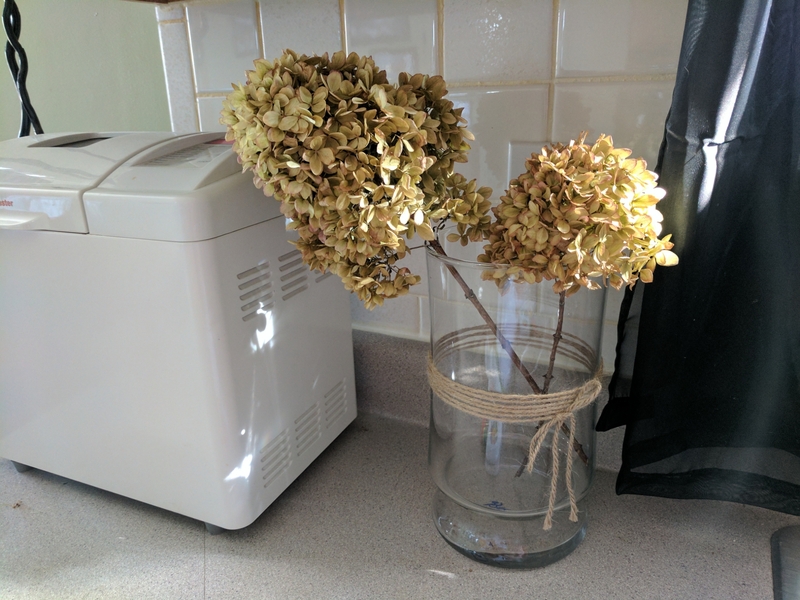 Lastly for the kitchen are these lovely flowers that I dried from my Little Lime Light hydrangeas. I was hoping to preserve them after they turned a beautiful rusty pink, but apparently I was too impatient. They are happily perched next to my sink where I can admire them while doing one of my least favorite chores. Now onto the living room where the bulk of my decor resides. 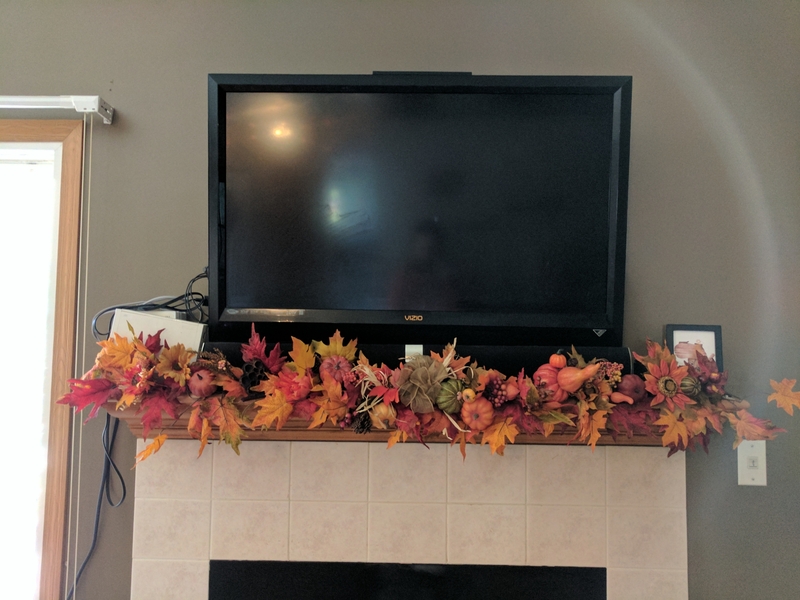 I always put this leaf garland on my mantle and fill it with fall flowers and festive sprigs. Yes, they are all plastic, but as much as I love natural elements in my decor, I love saving money even more. 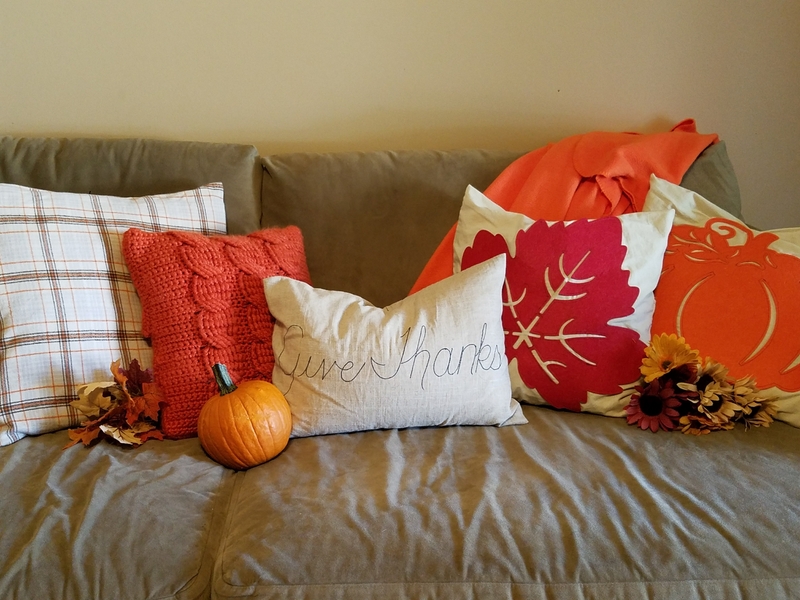 So any time I can make a decoration work more than once, I’m all over it (like the throw pillows). This guy I got from Walmart at the end of the season several years ago. 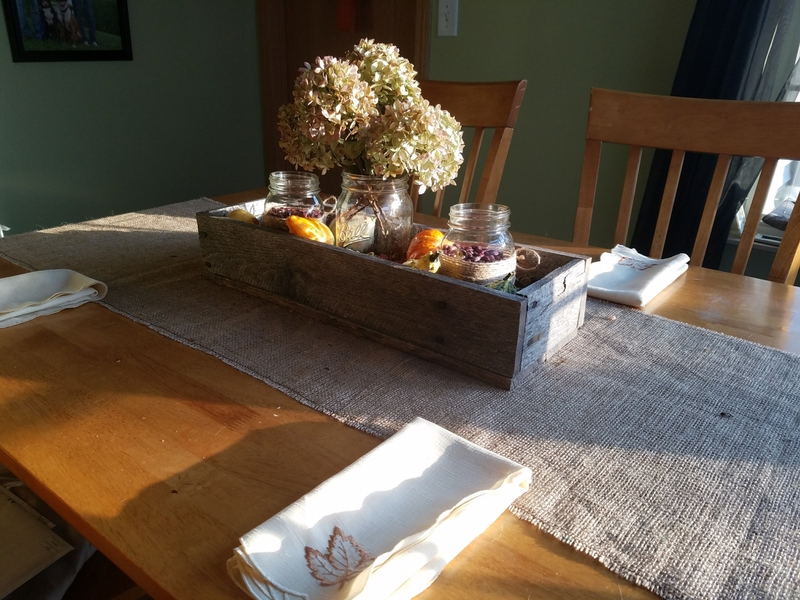 The little tea light holders I got at dollar store… Filled them with some deer corn I already had and wrapped some twine around. And apparently I’m really bad at remembering to light candles before taking pictures.😝 This is sitting on a bamboo serving tray on my ottoman. 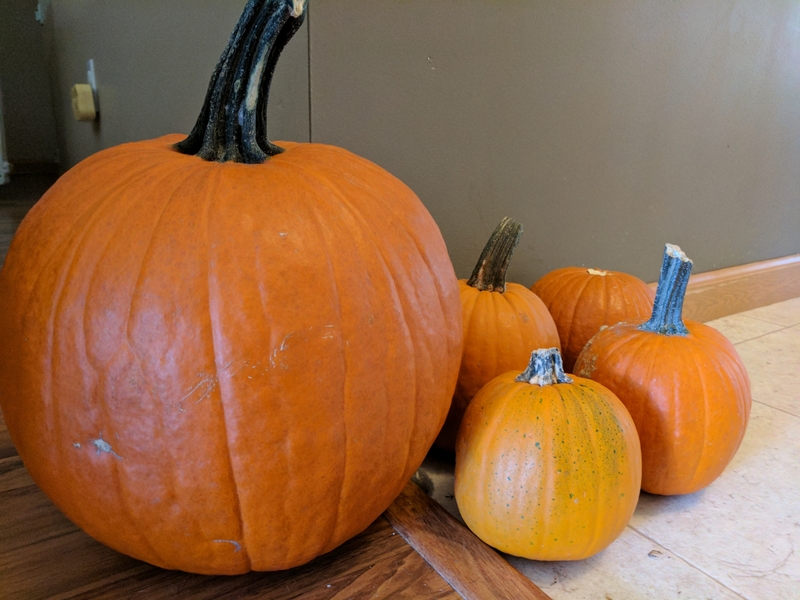 And my collection of pumpkins that are just waiting to be canned for next year’s goodies and Thanksgiving pumpkin pie. I just love pumpkins… They make me smile! 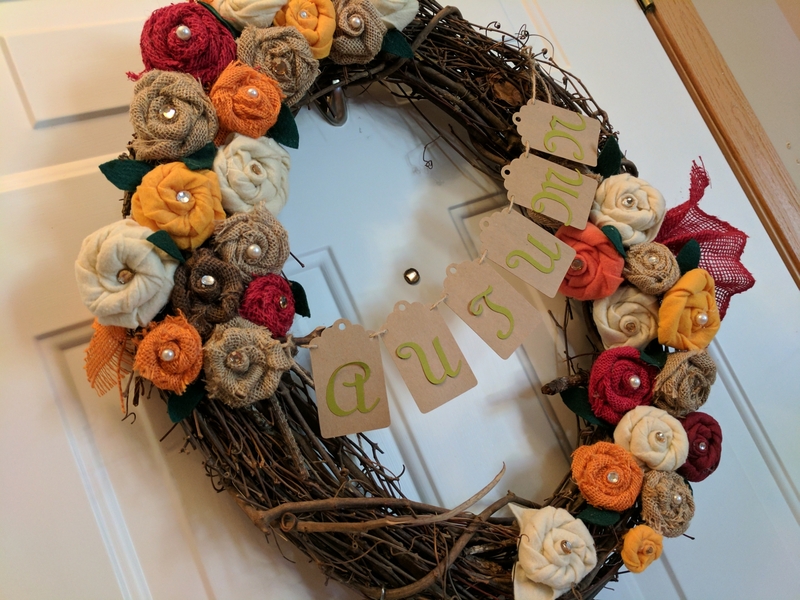 This wreath I made a few years ago at a ladies conference hosted by our church. It hangs on my front door. Last but not least… My favorite part! This corner table is kind of connecting my entry and living room. 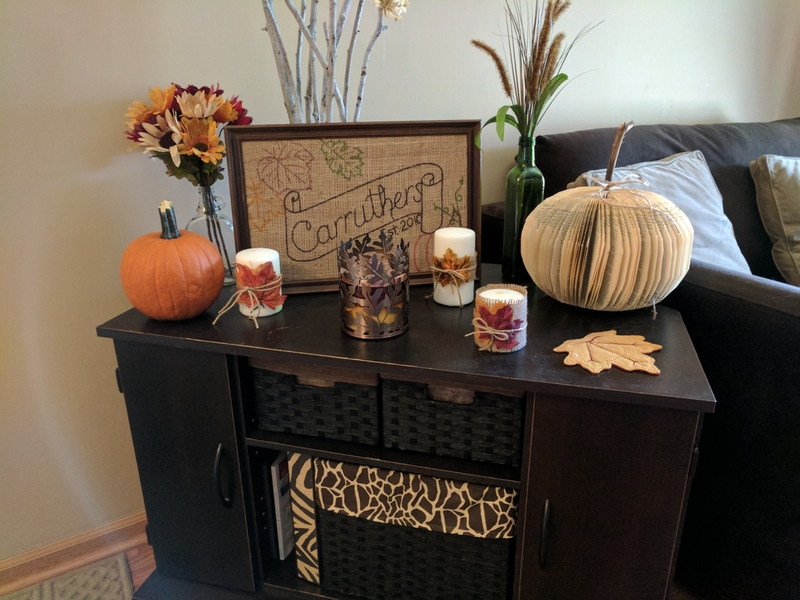 It is so great for decorating each season. probably my favorite spot because it is just a blank canvas! I love how all the little pieces came together for this one. Of course, you’ve seen the paper pumpkin. 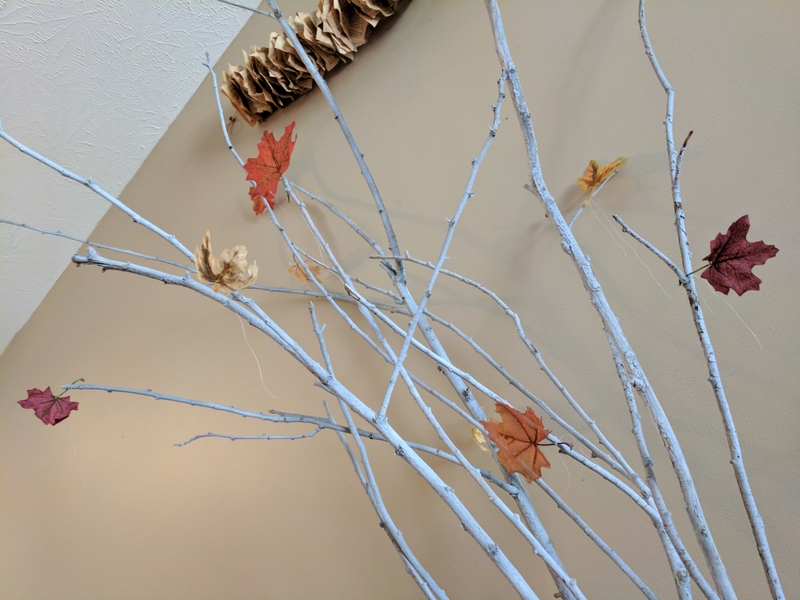 These spray-painted branches found their way into the living room last Christmas and never left. 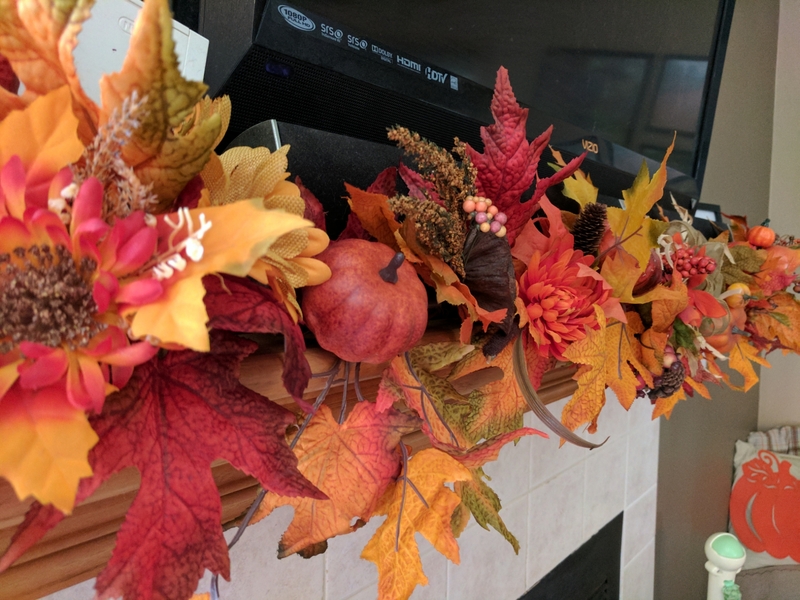 I tied some artificial leaves from the Dollar Tree to them to give them a festive look. (Ignore the string tails that I never cut off. 😊) Super cheap and easy, and I love how they turned out. These candles were also cheap and quick, but they add a big punch.. Got them from Walmart in a 3-pack for like $6 I think. I already had most of the supplies to simply and elegantly tie some burlap and leaves around them. I decided not to glue the decorations on so that I can reuse the candles at Christmas (see… reusing decorations again! Frugality in the works!). This frame I got at the thrift store for about 50c. Again, I had the burlap. I simply secured it around the cardboard frame back and drew on it with Sharpies, then put it back in the frame.